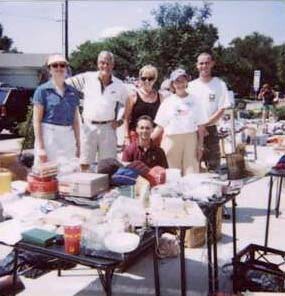 When we chose the date for GALT's Garage Sale, who would have thought it would be 100 degrees on May 31!!!! WELL IT WAS! GALT's volunteers sweated and worked the crowd to pull in over $1100 in a "short" five hours. Our sincere thanks to ALL who helped in every way, and especially to the doctors and staff of Animal Medical Center of Richardson, 590 West Campbell Road for allowing GALT to use their parking lot as the staging area.